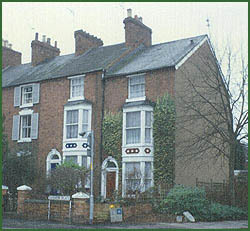 William and Anne lived their short lives in a number of different houses in Kidderminster, Worcestershire. They had only two children Frederick William Henry in 1876 and Kate Ann in 1879. There may have been another child but no record has been found. William was a Relieving Officer for the Poor Law Union - this may explain why the family moved around a lot. Worcestershire where they lived has as much natural beauty as any county in England. The south has better scenery than the north, but even the industrial towns of the Black Country are close to attractive countryside and have their compensations in the form of beautiful old buildings and churches. Just over a mile downstream from Worcester's magnificent Cathedral, the river Severn is joined by a sinuous stream called the Teme, one of the prettiest rivers in Britain, which winds its way through meadows, hop fields, woods, steep, lush green hills and orchards of cider apples and cherries. Beside its banks are bright green meadows; the soil is tinged with red sandstone, which dyes the water brick red when it's in flood. The farms grow hay, corn, apples and soft fruit, and burly Hereford cattle graze the meadows. Worcestershire comes third to Kent and Herefordshire as a hop-producing country, and most of the hops grow along the Teme and westwards towards Bromsgrove. When visiting the area in 1999 the unusual pointed roofs on the hop kilns intrigued us. We also encountered fields of soft blue flowers waving in the breeze - later we learned they were crops of linseed. The family lived at various addresses between 1873 and 1892 - Hylton Road, St Clements, Worcester, 92 Sutton Road, 1 Woodfield Terrace (and possibly also 12 Woodfield Terrace), 28 Blakebrook, 20a Sutton Road, and 12 Summer Place, all in Kidderminster. I had always been told that my grandfather's parents both died when he was 12/14 and it seemed something of a mystery. Were they accidentally killed or in some natural disaster together? The true story of their early deaths was nothing out of the ordinary except that they were both tragically young. His mother Anne died 28 October 1886 aged only 49, of a cerebral haemorrhage. He had married Mary Elizabeth Wright of Chaddesley Corbett, Worcestershire on 21 April 1892. We'll never know the circumstances behind this marriage - was she looking after him during his illness? 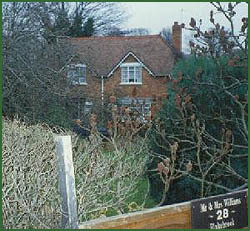 In his will he left three freehold cottages in Chaddesley Corbett, with gardens attached, to his widow! Maybe they belonged to her before the marriage? William's daughter Kate Ann was at the wedding, but where was Fred? Mary Elizabeth Wright was born in Chaddesley Corbett in 1839 to John and Jane Wright. John was a blacksmith. 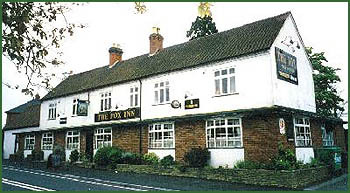 His brother James was an innkeeper and the book Steps into History tells of two Wright brothers who owned cottages in the village and constructed The Fox Inn round about 1838. It probably replaced an earlier inn for which in 1811 Thomas Baylis of Bluntington was granted a 99-year lease. In the early 20th century there was a sweet shop at the right hand end of the building. Behind the Fox was Dolly's or Jolly's Pit, a pond now filled in which was used for skating etc by local children. In Lower, or Nether Chaddesley as it was once called - the 5 old cottages on the right of the pub were served up to the 1960's by a water pump at the bend in the road, and the whole site once had metal railings surrounding it. Benteys History Gazeteer Directory and Statistics Worcestershire 1840 Vol 2 mentions John Wright, Blacksmith and Victualler, Fox Inn. An 1894 entry - Throckmorton Property Sale at Lion Hotel Kidderminster shows (amongst others) Fox Inn and Blacksmith shop sold for nine hundred and ten pounds. Mary had an older sister Rosa who died 1857, and a brother George born 1844. Her father John died 30 September 1852 aged 44 and her mother Jane died 23 June 1856 Lower Chaddesley aged 53. Chaddesley Corbett is a pretty village with half-timbered cottages and old buildings, notably the 14th century Talbot Inn. 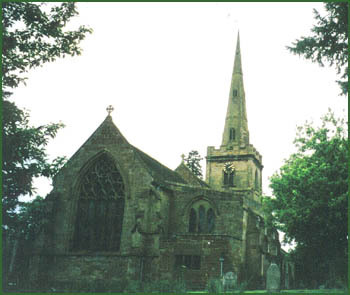 The 14th century church, where William and Mary were married, is dedicated to St Cassian who was murdered in the village. It has a 12th century font. 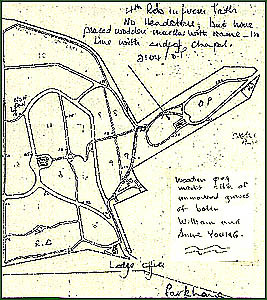 When we visited the village, the three cottages opposite the church, which are mentioned in William's will, are still there, however there are 2 sets of 3 cottages, which are the relevant ones?. The gross value of William's personal estate shown in his will after his death was seventy-nine pounds fifteen shillings and two pence! But what about those cottages???? The deaths of William and Anne in their early 40's, while certainly sad, have not turned out to be the mystery I had envisioned. 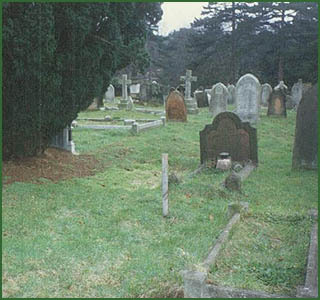 They are buried together in Kidderminster Municipal Cemetery - there is no headstone. Grave site - William and Anne Young. No headstone, wooden stake marks site. Click here for further information on William and Anne's son Fred (my grandfather).